Quarterly results from computing giant Hewlett-Packard just crossed the wires, and they’re close, but not close enough to what Wall Street had wanted to see. 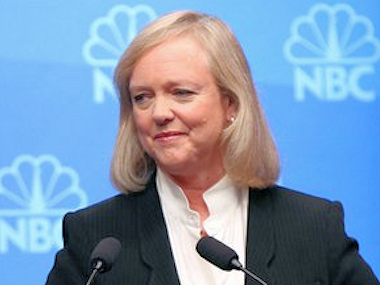 HP reported a per-share profit of 86 cents on sales of $27.2 billion. While the bottom-line number was in line with what analysts had expected, sales fell slightly short of the $27.3 billion consensus. HP shares fell by more than three percent immediately after the results were reported in after-hours trading. For the full year, HP said it expects to earn between $3.53 to $3.57 a share on a non-GAAP basis. That’s lower than what analysts had been calling for and is probably the primary reason the shares are falling. The results come after a busy day of revelations involving a significant management shake-up that saw Dave Donatelli, head of HP’s Enterprise Group, and Marty Homlish, chief marketing officer, both replaced. It was a tough quarter, no surprise there. PC sales fell about 11 percent, with sales to consumers down 22 percent. Printing revenue fell four percent, despite sales of printing hardware rising by five percent. Sales of printing supplies, once the cash cow at HP, fell four percent. Revenue in the enterprise group fell nine percent year on year. This is probably one big reason why Donatelli was replaced with Bill Veghte today. Networking sales were flat, but sales of industry standard servers fell 11 percent while business critical servers fell 26 percent. Update: I just got off the phone with CEO Meg Whitman, and naturally the first thing I asked her about was the management shake-up. Whitman said she has “no immediate plans” to name a new COO to replace Veghte. Since Veghte has, in that role, been seen as the logical No. 2, I asked her about who the new No. 2 is. She said part of her long-term management strategy is to build a bench of potential successors from within. Since hanging up the phone with Whitman, the announcement on the management shake-up has crossed the wires. Here’s what HP is saying about Donatelli’s new role. Time will tell if this description is simply cosmetic or if Donatelli will actually leaves the company. He’s often mentioned as a contender for CEO jobs outside HP. HP today announced financial results for its third fiscal quarter ended July 31, 2013. Third quarter GAAP diluted earnings per share (EPS) was $0.71, up from a GAAP diluted loss per share of $4.49 in the prior-year period and above its previously provided outlook of $0.56 to $0.59 per share. Third quarter non-GAAP diluted EPS was $0.86, down from $1.00 in the prior-year period and within its previously provided outlook of $0.84 to $0.87 per share. Third quarter non-GAAP earnings information excludes after-tax costs of $286 million, or $0.15 per diluted share, related to amortization of purchased intangible assets, restructuring charges and acquisition-related charges. For the third quarter, net revenue of $27.2 billion was down 8% year over year and down 7% when adjusted for the effects of currency. For the full year fiscal 2013, HP estimates non-GAAP diluted EPS to be in the range of $3.53 to $3.57 and GAAP diluted EPS to be in the range of $2.67 to $2.71, in line with HP’s previously communicated outlook. Full year fiscal 2013 non-GAAP diluted EPS estimates exclude after-tax costs of approximately $0.86 per share, related to the amortization of purchased intangible assets, restructuring charges and acquisition-related charges. HP generated $2.7 billion in cash flow from operations in the third quarter, down 6% from the prior-year period. Inventory ended the quarter at $6.5 billion, down 1 day year over year to 28 days. Accounts receivable ended the quarter at $14.3 billion, down 1 day year over year to 47 days. Accounts payable ended the quarter at $13.3 billion, up 7 days year over year to 57 days. HP’s dividend payment of $0.1452 per share in the third quarter resulted in cash usage of $280 million. HP also utilized $3 million of cash during the quarter to repurchase approximately 168,000 shares of common stock in the open market. HP exited the quarter with $13.7 billion in gross cash. Personal Systems revenue was down 11% year over year with a 3.0% operating margin. Commercial revenue decreased 3% and Consumer revenue declined 22%. Total units were down 8% with Desktops units down 9% and Notebooks units down 14%. Printing revenue declined 4% year over year with a 15.6% operating margin. Total hardware units were up 5% with Commercial hardware units up 12% and Consumer hardware units up 2%. Supplies revenue was down 4%. Enterprise Group revenue declined 9% year over year with a 15.2% operating margin. Networking revenue was flat, Industry Standard Servers revenue was down 11%, Business Critical Systems revenue was down 26%, Storage revenue was down 10% and Technology Services revenue was down 7%. Enterprise Services revenue declined 9% year over year with a 3.3% operating margin. Application and Business Services revenue was down 11% and Infrastructure Technology Outsourcing revenue declined 7%. Software revenue was up 1% year over year with a 20.5% operating margin. Support revenue was up 4%, license revenue was flat, professional services revenue was down 11% and SaaS revenue was up 4%. HP Financial Services revenue was down 6% year over year with a 4% decrease in net portfolio assets and a 9% decrease in financing volume. The business delivered an operating margin of 11.3%. HP’s Q3 FY13 earnings conference call is accessible via an audio webcast at www.hp.com/investor/2013Q3webcast.